Dan Carter accepts the GOP endorsement for U.S. Senate. State Rep. Dan Carter, R-Bethel, a three-term legislator and former military pilot, won the Republican endorsement for U.S. Senate on Monday in a rejection of the yearlong campaign of August Wolf, the businessman and Olympian who was the GOP’s only candidate until last month. 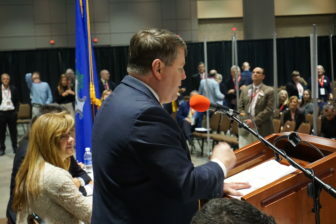 Jack Orchulli, the last candidate to jump into the race, conceded defeat after first-round voting was complete and urged delegates to rally behind Carter, allowing the party to focus on defeating the formidable Democratic incumbent, Richard Blumenthal. “It’s the only way we have a chance to win it,” Orchulli said. 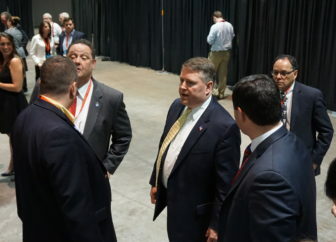 Wolf, who had cleared the 15-percent threshold necessary to automatically qualify for a primary, fell below that mark as delegates heeded Orchulli’s call for unity and switched votes before the ballot was closed. Carter was declared the winner with 907 votes; Wolf had 123 and Orchulli, 20. Wolf left without comment as the vote-switching continued. He still could try to force a primary by gathering petition signatures from 2 percent of registered Republicans. Carter said he was grateful to Orchulli. Jack Orchulli, seated, and August Wolf watch the voting go against them. Republicans also endorsed five congressional candidates Monday: Matthew Corey in the 1st District, Daria Novak in the 2nd, Angel Cadena Jr. in the 3rd, John T. Shaban in the 4th, and Clay Cope in the 5th. Novak may face a primary from Ann Brookes, who lost by just five votes. Larry Kudlow, the CNBC commentator many Republicans hoped would bring his media skills and name recognition to a race against Blumenthal, addressed the 1,182 delegates in the Connecticut Convention Center in Hartford, urging them to unite behind their presumptive presidential nominee, Donald J. Trump. Carter told the fast-dwindling crowd of delegates – fewer than half were present when he accept their endorsement at 9:30 p.m. – that he was in the race to win, a task Linda McMahon could not manage in 2010 with a budget of $50 million. Carter and his supporters watching as Wolf seemed to qualify for a primary. He mocked Blumenthal for using the Senate as a platform to talk about the safety of artificial turf used by high school athletes, the size of airline seats and the labeling of genetically modified salmon at a time when the U.S. is facing a weak economy and the threats of international terrorism. As a state legislator, Carter has a conservative record, voting against the gun-control law crafted in response to the Newtown school shooting, the repeal of the death penalty, the decriminalization of small amounts of marijuana, two minimum wage increases and a mandate on some private employers to offer paid sick days. He voted for the legalization of medical cannabis. Carter acknowledged a difficult task awaits, the first being to begin a major fundraising effort. Blumenthal already has a head start, raising about $6.4 million. He had about $4.6 million in cash on hand at the end of March and name-recognition that Carter cannot hope to fully match, even with significant advertising. 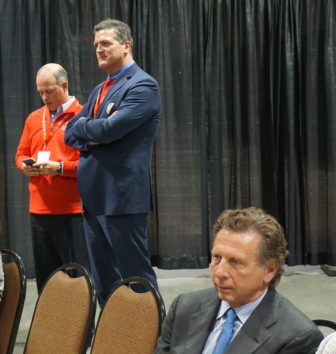 Carter and Orchulli both entered the race at the urging of Republicans, who grew alarmed with the Wolf campaign after fund-raising problems and the noisy departures of top staffers, who described a campaign in disarray. Wolf said in late March he had stabilized his campaign and brought on new staff. In recent days, he used a connection from the Olympics movement: Delegates received a robo-call on his behalf from Mike Eruzione, the captain of the 1980 Olympic hockey team that upset the Soviets to win a gold medal.